Today sees the launch of Yousef’s brand new ‘21st Century House music’ weekly radio show on DI FM. Kicking off at 7pm GMT (2pm EST) the show will be a one-hour thrust through every crevice of modern house music, from deeper and more laid-back sounds to the more frenetic and fuller festival tackle. The shows mark something completely representative of the full spectrum of house music. Yousef is also currently starting a global tour to promote his soon to be released second artist album ‘A Product Of Your Environment’, which sets out to paint a technicolour picture of a DJ long player. Moving away from the usual process of a beat led project that has become so familiar among DJs, the album is designed to be listened to from start to finish, a complete work. With full songs, complete instrumentation and a focus on melody the album equally takes time for a sophisticated selection of serious club workouts. 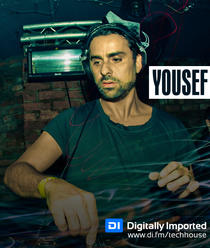 While reflecting Yousef’s standing as a global DJ, it’s influenced by Yousef’s personal history and global travelling exploits. The title gives way to the true meaning of Yousef’s work, where he has been influenced not just by the clubs he works in but the world around him as well. In a year where his personal life has reached an all time high the project reflects experiences he has been through as well as the worldwide clubs he continues to rock. Get more info on the DI show HERE.